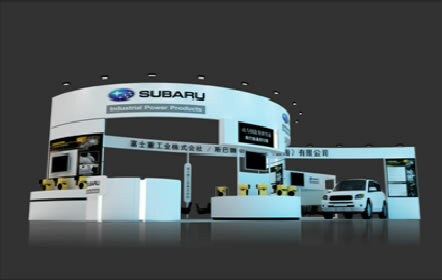 FHI to Exhibit for the first time at "bauma China 2012"
Tokyo, November 26, 2012 - Fuji Heavy Industries Ltd. (FHI), the maker of Subaru automobiles, today announced that the company will participate in "bauma China 2012", an international trade fair for construction machinery to be held at Shanghai, China from November 27 through November 30. This will be FHI's first involvement in the fair. Under its exhibition theme "Power Produces Better Life", FHI's Industrial Power Product Company, one of the three non-automotive business divisions of FHI, will introduce its business through the exhibition of its products and technologies that are offered in line with its mission statement "Provide ‘Power' to Support Human Living". As a global general-purpose engine manufacturer, FHI's Industrial Products Company designs, manufactures and sells Subaru general-purpose engines mounted on construction equipment, industrial machinery and agricultural equipment as well as high performance engines for snowmobiles and ATVs (All-Terrain Vehicle). It also builds engine-driven generators, floodlight units and water pumps. This August, FHI jointly established a sales company named Subaru Industrial Power Products of China Co., Ltd. (SIPC) with Toyota Tsusho (China) Co., Ltd. of Toyota Tsusho Group (Toyota Tsusho), aiming to enhance the sales structure for its industrial products sold in China. By showcasing Subaru general-purpose engine "EX series" which is a main product for Chinese market and other high products in bauma China 2012, FHI will emphasize the features, ease of installation, technical solutions, etc., offered by Subaru general-purpose engines, and lead it to enhance and expand the sales in Chinese market.